This is the third sampler design that is being featured as a giveaway chart in Dolls House World magazine (the March issue, number 222), which is on sale now. If you get yourself a copy, you can stitch the design from the colour block chart included in the magazine. You’ll need a piece of 32 count evenweave fabric, a size 26 tapestry needle, and some Anchor stranded cotton. 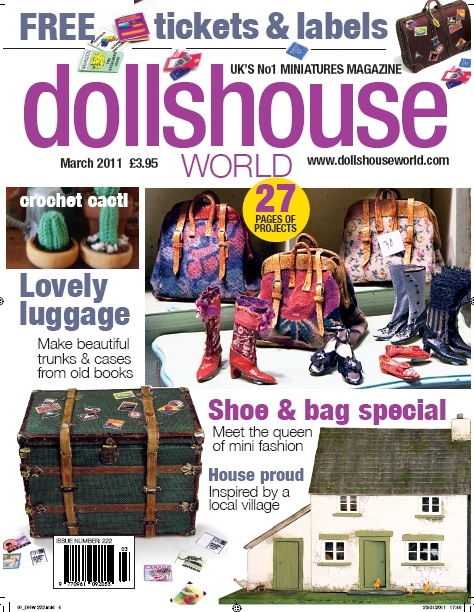 This is the cover of Dolls House World this month, so look out for it! If you prefer to buy the full kit from me (which includes a stained and varnished wooden picture frame, to mount the sampler in), then you can take advantage of the special offer in the magazine to get 25% off the usual kit price. Just quote the Discount Offer Code listed in the magazine when you buy online from my website, and you can buy the sampler kit for £6 instead of £7.95. This ‘Ackworth’ style of sampler is much more unusual than the ‘band sampler’ type, or ones with a phrase or saying on them stitched in rows that we usually see. The Ackworth school was opened in 1779 near Leeds, Yorkshire. It was a boarding school run by Quakers, taking in both boys and girls, where the girls were taught embroidery of a very distinctive kind. The surviving samplers from this school have in recent years become very collectable, due to the unusual way that the girls stitched their sampler designs. Rather than the more common designs of the time, where lines of alphabets and numerals took pride of place, they used a method of stitching medallions freehand on the fabric, which gives a very pleasing, but naïve, look to the samplers. It is thought that this was a way to teach them about mathematics, particularly fractions. The phrase ‘A Token of Love’ is taken from wording used on items made by Ackworth schoolgirls as gifts, but still using the same medallion style of decoration as on the samplers. I have interpreted this style for one twelfth scale, to make a sampler which would be suitable for any late Georgian or early Victorian doll’s house. 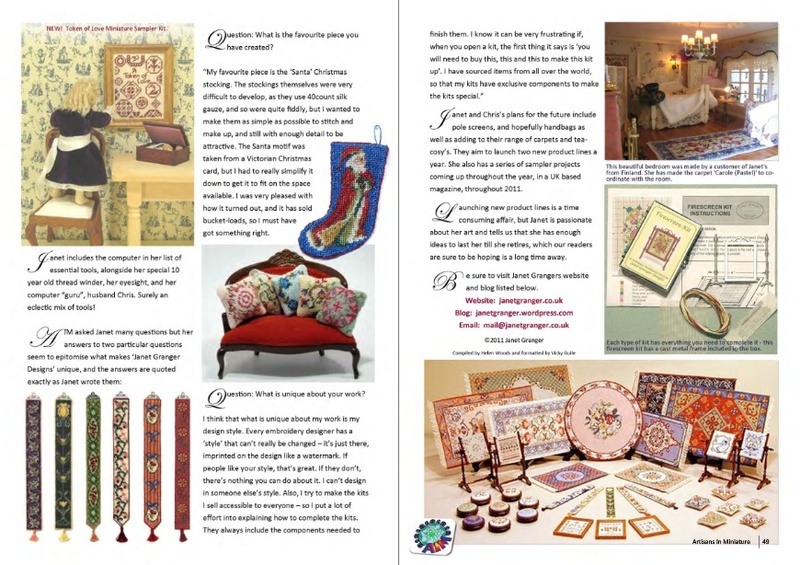 This month, there is an article about how I started my miniature needlepoint kit business in the Artisans in Miniature online magazine. This is an amazing magazine – if you haven’t come across it before, you don’t know what you’ve been missing! 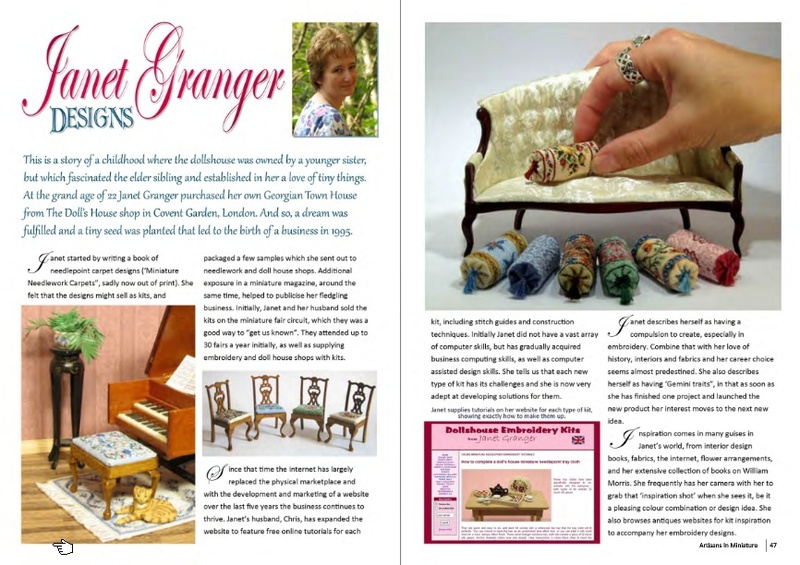 It’s created by professional miniaturists, to showcase their work to people who love minatures…but the difference between it and printed magazines is that this one is completely FREE!! That doesn’t mean, though, that it is low-quality. On the contrary, I decided to contribute towards the Artisans in Miniature magazine because when I saw the high quality of the magazine (its presentation, attention to detail and types of articles and how-to’s that it featured in each issue), I knew I wanted to be part of such a great project! Their main website is here. 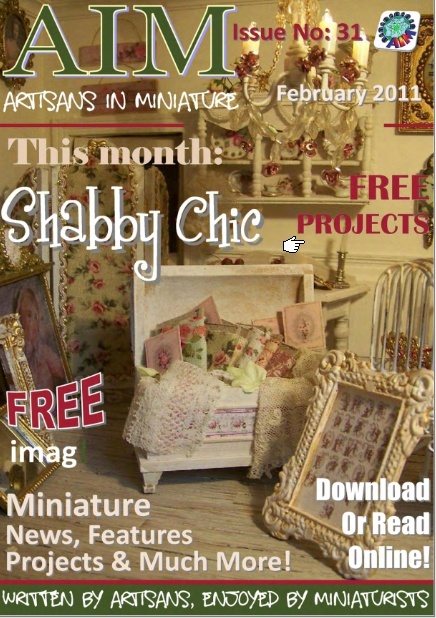 This month’s issue has 140 pages, and the theme of the magazine this time is ‘shabby chic’. You can see from the image of the index page above that it promises lots – and you won’t be disappointed! In-depth articles, projects, gallery pages, and much more. 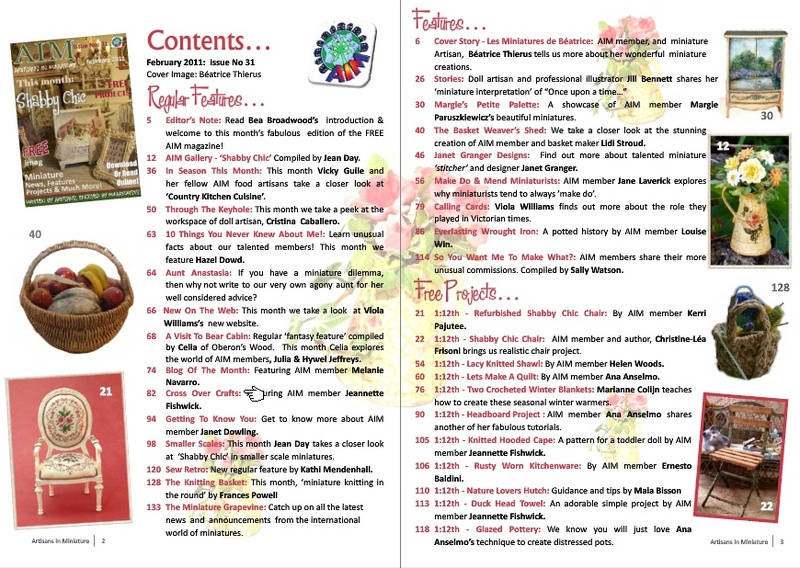 Click here to browse the magazine now (don’t forget to look at pages 46 – 49, where the article about my miniature needlepoint kits appears ). Janet Granger's Blog Create a free website or blog at WordPress.com.